I first became aware of Sly And Robbie on the 1980 Black Uhuru album Sinsemilla. They were a big deal in the 80s appearing on reggae albums by major reggae stars like Black Uhuru, Peter Tosh and Culture, but also with major rock stars like Bob Dylan and Mick Jagger. This album was produced by Material/Bill Laswell (another pretty big deal in the 80s). Laswell is a pretty innovative cat who rides a thin line between funk and jazz. He is equally comfortable in hip hop and dance noise. I knew nothing about this album – I plucked it out of the crate based on Sly And Robbie and Laswell’s reputation. 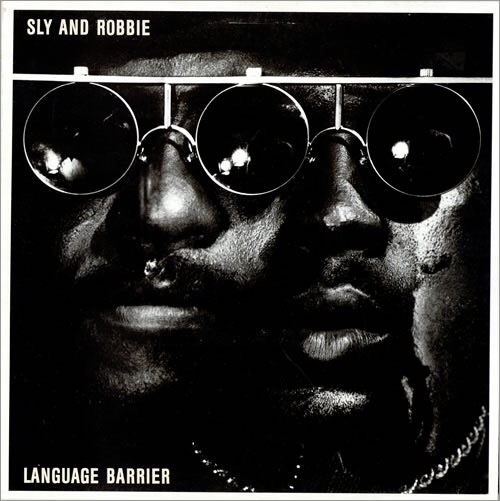 When I first listened to Language Barrier the first thing that I thought of was Herbie Hancock’s “Rockit,” which Laswell produced a couple of years earlier. This is barely a reggae album and that is all right. There are plenty of great reggae grooves graced by Sly and Robbie. It is cool to hear this distinctive rhythm section hijacked for another cause. The album features some pretty fantastic guests: Bob Dylan (who plays some subtle mouth harp on one song), Herbie Hancock, Afrika Bambaata, Doug E. Fresh (aka the Human Beatbox) among others. This album was a flop commercially, but it is still a great LP. It is a very 80s sounding record – it accentuates the art side of that periods pop – it rides the edges. It sounds pretty damn innovative in hindsight. With each listen the groove gets deeper and funkier. There are a lot of layers here. Don’t ride the surface, dive deep. If you can imagine EDM with soul, check out this LP. As for the digging, I found this gem in near mint condition at The Electric Fetus (opened but still in shrink-wrap). A bit overpriced at $9, I am accepting of inflation in the vinyl market these days, especially at parlors of hipness like The Fetus. The album has given me great enjoyment so the groove to value ratio has been high. Sorry not available on Spotify, so no playlist.